Snow covered vehicles sit on Commonwealth Avenue on Feb. 9, 2013 in the Brighton neighborhood of Boston, Massachusetts. The powerful storm has knocked out power to 650,000 and dumped more than two feet of snow in parts of New England. 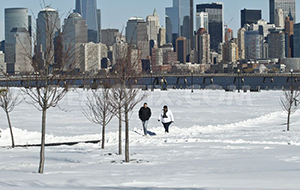 The northeast of the United States crawled out from under a mammoth blizzard Sunday that caused at least nine deaths and paralyzed the region with high winds and heaps of snow. More than 300,000 customers were still without power in the wake of the storm that struck a slew of states and dumped as much as three feet of snow across New England before battering three Canadian provinces. The majority of the service disruptions were in hard hit Massachusetts, where Governor Deval Patrick said outages were at 250,000, down from 400,000 Saturday.